Devise strategies for reducing drop burden on surgical patients. Describe the different categories of EFA and their importance in maintaining ocular health. Understand the key clinical trials investigating EFA supplementation for DED and possible reasons for the different conclusions. Dry AMD Pathobiology: Role for Antiinflammatory Therapies? Identify infectious and non-infectious conditions associated with IU. Outline the signs and symptoms of IU and preferred treatment strategies. Explain leading hypotheses on AMD pathogenesis. Name novel anti-inflammatory target molecules in clinical or preclinical study for AMD. Describe the mechanisms of ocular hypertension in uveitic glaucoma. Formulate appropriate treatment plans directed at inflammation and raised IOP, respectively, for patients presenting with uveitic glaucoma. Identify and better manage contact lens discomfort. Differentiate inflammatory from infectious keratitis. Summarize the evidence pointing to inflammation as a component of diabetic eye disease. Apply evidence from published studies to the antiinflammatory treatment of diabetic macular edema. Explain amniotic membrane therapy’s role in the treatment of inflammatory ocular surface disease, specifically dry eye disease (DED). Describe amniotic membrane’s therapeutic actions and ophthalmic uses. Differentiate seasonal allergic conjunctivitis (SAC) from other allergic eye diseases. Plan a prophylaxis approach to SAC. Discuss the potential adverse effects associated with different classes of topical antiinflammatory agents. Optimize antiinflammatory regimens for chronic ocular surface disorders by minimizing drugs’ side effects. Understand the various MIGS options and their general characteristics. Outline the postsurgical management of inflammation and IOP for different MIGS. Understand and implement a stepwise approach to treating uveitis when appropriate. Identify new uveitis therapies with the potential to modify their treatment paradigm. List three potential ocular surface anti-inflammatory drug targets and weigh the advantages of available treatments to manage inflammation in ocular surface diseases. Describe the immune/inflammatory pathways at work on the ocular surface. Identify risk factors, mechanisms, and types of corneal graft rejection. Compare strategies to manage inflammation and graft rejection. Outline current and potential steroid-sparing drugs for the treatment of ocular inflammation. Apply knowledge of the different classifications and mechanisms of action of steroid-sparing therapies to treatment plans. Identify the possible sources of ocular surface pain and inflammation, taking into account possible systemic or neuropathic origins. Recognize the signs and symptoms of AKC and VKC and the underlying mechanisms involved in the inflammatory process. Know the current management practices for the treatment of AKC and VKC. Understand the risk of steroid response for different patient groups and types of medication. Outline postsurgical management strategy to control IOP and inflammation. Optimize drug selection for the treatment of chronic inflammatory OSD. Improve use and monitoring of currently available antiinflammtory medication available for long-term use. Assess surgical approaches and the potential for inflammation. Identify symptoms of inflammation and outline postsurgical management. Understand the variables that influence association between ocular surface inflammation associated with refractive surgery. Reduce ocular surface inflammation in refractive surgery patients. Describe the immunoinflammatory pathway underlying DED. Improve management of DED by focusing treatment strategy on the prevention and treatment of ocular surface inflammation. Make earlier diagnosis of dry eye associated with an underlying systemic inflammatory condition. Engage in a multidisciplinary clinical approach to systemic inflammatory disease with ocular surface consequences. Distinguish anatomic sites of blepharitis. Better manage patients with anterior blepharitis or MGD. Approximate patient risk for dry eye disease. Design a protocol for detecting and diagnosing MGD in the clinic. Evaluate a glaucoma patient for ocular surface disease. Manage ocular surface disease in glaucoma patients. Examine the role of inflammation in the pathophysiology of dry eye. Formulate diagnostic and therapeutic strategies for managing the ocular surface inflammation associated with dry eye. Improve outcomes of cataract surgery by identifying and treating preexisting dry eye. Minimize postoperative inflammation with appropriate anti-inflammatory therapies. NSAIDs and the Ocular Surface: What are the Concerns Today? Identify patients at high risk for NSAID-associated adverse events. Describe a strategy for long-term antiinflammatory treatment of ocular inflammation that minimizes the risks associated with long-term steroid exposures. Devise topical NSAID regimens that ensure therapeutic efficacy while minimizing the risk of adverse events in the management of postsurgical complications. MMP-9, Corticosteroids, and Ocular Surface Disease: A New Paradigm? 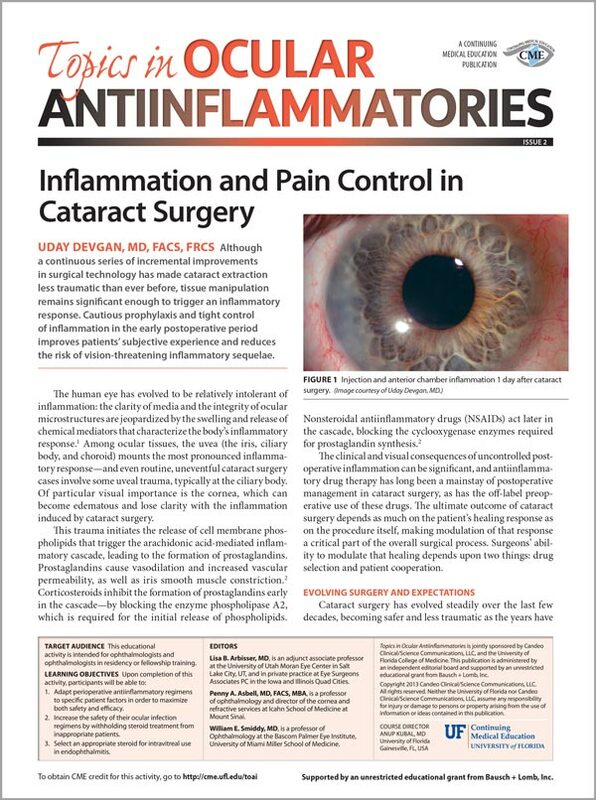 Antiinflammatory Prophylaxis for Cataract Surgery: Corticosteroid, NSAID, or Both? Incorporate topical NSAIDs into the perioperative and postoperative management of cataract surgery to optimize patient results. State the limitations to MMP-9 testing for the diagnosis of dry eye disease. Timing the administration of medication to prevent mast cell degranulation makes sense for patients with severe seasonal allergic conjunctivitis. Gain a better clinical management of patients with ocular graft-vs-host disease that may lead to new approaches to diagnosis, prevention, and treatment. Outline a practical course of action for perioperative care of uveitis patients undergoing cataract removal surgery with IOL implantation. Engage in a multidisciplinary clinical approach to ocular inflammatory disease associated with systemic disorders. Select a corticosteroid for postoperative antiinflammatory prophylaxis based on a balance of patient need for potency and presence of risk factors. Differentiate acute demyelinating optic neuritis from other optic neuropathies based on clinical features. How Do Ocular Corticosteroids and NSAIDs Work? Evaluate the mechanisms of action and pharmacokinetic properties of ophthalmic corticosteroids and NSAIDs in order to provide the most appropriate antiinflammatory therapy for patients. Identify uveitis patients for whom the risks of intravitreal corticosteroid implant may outweigh the benefits. Reduce the risk of side effects in patients being treated with topical corticosteroid for common inflammatory conditions of the ocular surface. Improve treatment of patients with uveitis through identification of agents and routes of delivery shown to reduce intraocular inflammation. Adopt strategies for effective treatment of serious ocular allergy that minimize risk of medication side effects. 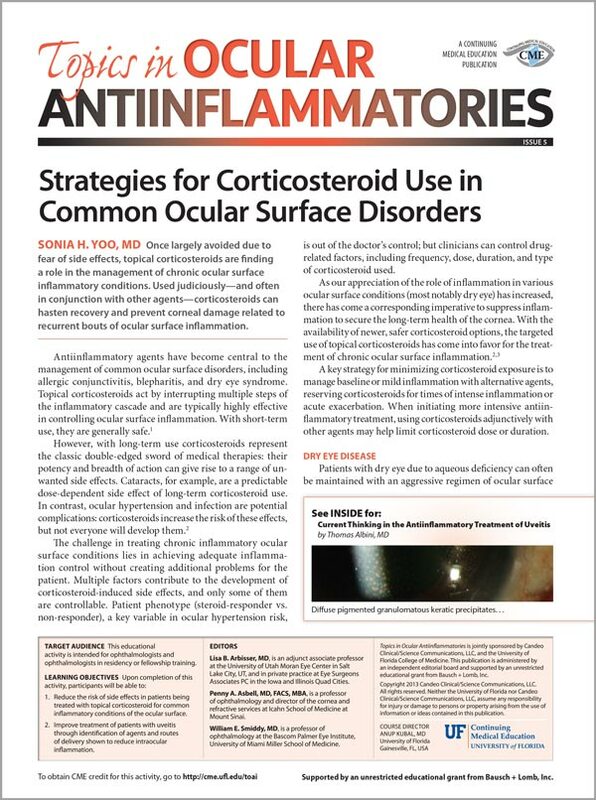 Employ strategies for minimizing corticosteroid side effects in patients who require chronic management of severe ocular inflammation. Reevaluate corticosteroid regimens in light of potency and risk profile of newly available agents. Devise strategies to minimize risk to patients associated with antiinflammatory drugs. What is the Role of Steroids in Treating Ocular Infection? Adapt perioperative antiinflammatory regimens to specific patient factors in order to maximize both safety and efficacy. Increase the safety of their ocular infection regimens by withholding steroid treatment from inappropriate patients. Select an appropriate steroid for intravitreal use in endophthalmitis. Formulate effective, efficient prophylactic antiinflammatory regimens for cataract surgery patients. Discern patients at increased of pseudophakic CME. Explain how anterior segment surgery can produce inflammatory damage in the posterior segment and cite ways to prevent this from occurring.